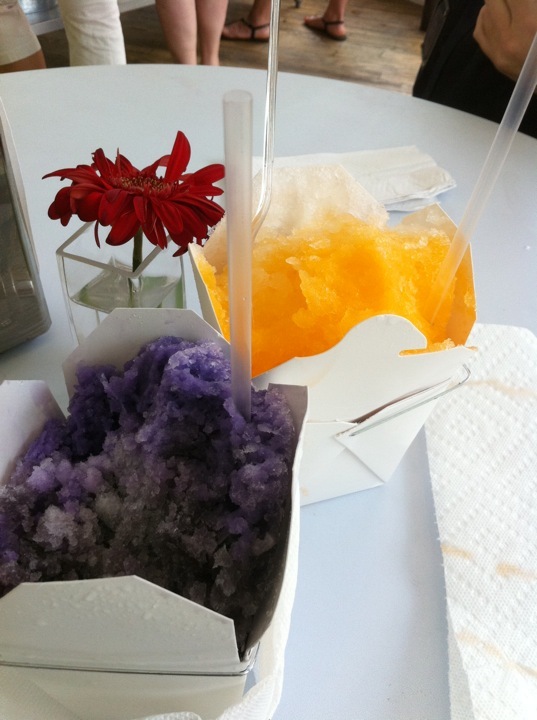 Last Taste of Summer: Sno-balls in NYC! Hurricane Irene has passed and there’s one more blazing hot week ahead of us in NYC? Where am I going to stop to cool off? Imperial Woodpecker Sno-balls has been a favorite destination of mine this summer. You could compare a sno-ball to the icy, sno-cones I used to eat as a little kid at the circus, but that wouldn’t do the sno-ball justice. Sno-balls are a Southern treat, originating in New Orleans, and created by shaving blocks of ice using a special machine that produces fluffy, light-as-air shaved ice with the consistency of freshly fallen snow. With over 33 flavors (including all the usuals plus unique flavors like Tiger Blood, Mardis Gras King Cake, Orchid Cream and Sweet Lou’s Nectar Cream) and two topping options (condensed milk and vanilla ice cream), the number of flavor combinations you could create is endless! I’ve listed some of my favorites below. Imperial Woodpecker Sno-balls is closing it’s doors at the end of August, so you have just a few days left to try out these Southern delicacies for yourself!